Jumia is back again with her annual Mobile Week sales. 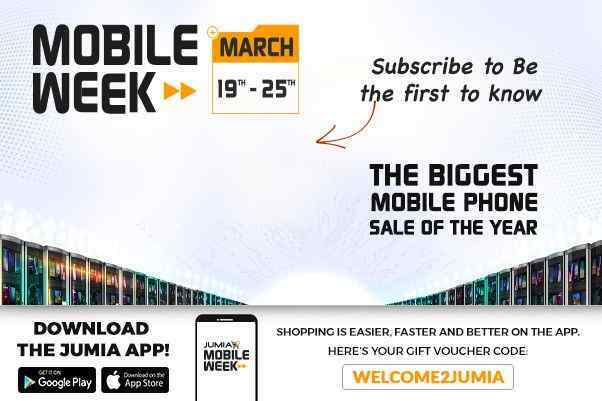 As we all know, Jumia's mobile week is a discounted mobile sales promo where goods especially Phones and Tablets are sold at discounted prices. This year's mobile week promo is still being sponsored by the same companies and organizations that sponsored it last year. Which means that you should expect lots of discounts on Tecno, Infinix, LG, Innjoo, Samsung, Fero, and even Apple smartphones. The Jumia mobile week sales is usually a 7-day promo, this year wouldn't be an exception, though the promo would begin earlier. This year, the mobile week promo commences from 19th to 25th March, unlike last years' which was held from 24th to 30th April. • The promo would run from 19th to 25th March 2018. • Over 1Million products would be discounted. Note that the information above was officially announced by Jumia, but yet to be confirmed since the promo is yet to begin. However, I advise that you register your email now for deals notifications. Last years' mobile week sales were quite disappointing as it didn't meet my expectations. However, I believe Jumia must have learned from that and would give us something worth remembering this year, even though a sneak peeks of the deals they plan to offer disputes this hope. The sneak peek of the deals Jumia has in store this year is definitely not gonna get anyone excited, it's just a total mess. The names of the devices on the list are incorrect, the prices are false and the discounts are unreal. The list says that the official price of last three years' Tecno W3 LTE is a whopping 328,000Naira!!! Are they for real??? This is just one of the many mistakes you would find in the Jumia deals sneak peek above. I sincerely hope Jumia doesn't bring those mistakes into reality when the mobile promo starts because that's not gonna be fun at all.